Updated version of my guide to Cartagena. Just finished my second delivery. 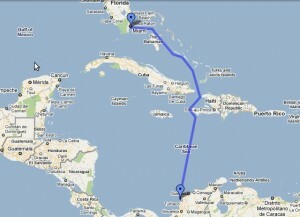 Warning: Do not travel this route during high hurricane season from August to October. Caution: From June until November, keep a sharp eye on tropical weather and avoid crossing the Caribbean Sea if a storm is predicted. The key to cruising from Southeast Florida ( whether your departure location is Fort Lauderdale, Miami, or further north such as Stuart ) to Colombia is to stay as far east as possible. The prevailing south easterly trade winds will push you west to Panama and force you to beat back to Colombia. The trick is to sail into the Bahamas, follow along the leeward side of the Exumas, shoot through the Windward Passage, and power reach down to Cartagena. If the winds are strong from the south east, a trick may be to hug the west coast of Haiti and leave Navassa well to starboard. Then let the winds lift you as far east as possible when you round the mountainous coast. The winds sometimes wrap around Hispanola here and will come from due south. The further east you are lifted, the more you will have in the bank during the long Caribbean Sea crossing. Do not go north around Hispanola and leave the Dominican Republic to starboard. You are wasting your time going 300 nautical miles upwind when you can catch the currents underneath Hispanola for the same effect. Read on for a more detailed report on the two halves of this journey. The first half of your passage through the Bahamas will be motoring through calm and scenic green waters. Take your fishing gear and troll along to maybe catch a tuna or dolphin. The Tongue of the Ocean is a particularly good spot to catch fish as the depth drops off from 10 feet along the banks to 100 feet. Your vessel must draw 6 feet or less to avoid running aground or hitting coral heads along the Exumas Banks of this route. You should refuel and fill up on water sometime through here such as Highbourne or Staniel Cay before making the big jump when leaving the Bahamas and passing through the Windward Passage. You could cut through to Georgetown on the windward side. Your last option in the Bahamas is Inagua. I highly recommend not stopping here unless you like to tie up to concrete fuel docks with rusty rebar sticking out to gauge your gelcoat. The second half has few stopping options. If a storm is brewing you could find safe harbour in Cuba, Haiti, or most likely Jamaica. None of these spots are the most welcoming for cruisers, so the best route is to hope for normal weather. Even so, the predominant weather in the Caribbean Sea is pretty rough. Expect sustained wind of 20 to 30 knots and seas from 5 to 15 feet. In June of 2011, I crossed the Caribbean to Cartagena on a Catalina 320 through a tropical wave with gusts up to 39 knots. In November of 2011, I crossed in exceptional calm weather on a Leopard 46 catamaran. 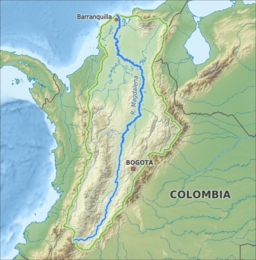 Once you arrive near Colombia, make sure you avoid the Magdalena River’s mouth which is a treacherous delta of shoal water and flotsam. Large logs and dead cows float out of here are high speeds. To enter Cartagena, follow the coastline and pass through the entrance buoys which mark the ancient sunken wall that kept out eighteenth century pirates. For anyone who considers such a trip, I say go for it. The destination is incredible. Colombia is a beautiful country with a happy, welcoming people. Forget the horror stories of rats as big as cats and rampant crime. Colombia has changed since the 80’s and 90’s, and you will as safe as in any other Latin American country. And the country is only getting better with continued investment from the USA and other allies abroad. Espero que nos vemos alla. Hasta entonces, chao. Next Next post: Leopard 46 Review: Better Than a Lagoon?